Long-time Samford University faculty member David Foreman died May 1 following a months-long battle with cancer. 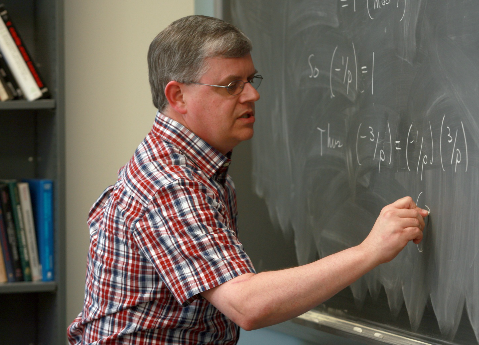 He was associate professor of mathematics and joined the Samford faculty in 1986. Funeral services are set for 2 p.m. May 7 at Brookwood Baptist Church, 3449 Overton Road, Birmingham. Visitation is from 5-8 p.m. May 6 at the church. A memorial service for the Samford community is set for 3 p.m. May 12 in Samford's Reid Chapel. "David was a beloved colleague with a remarkable gift for teaching and enormous capacity for affirming others. He lived his Christian faith authentically through service to his students, his church, and devotion to his family," said Samford Provost and Executive Vice President J. Bradley Creed. "The strength and legacy of Samford University resides in people like David Foreman who through his living and his dying taught us about faith, hope, and love. As a community, Samford mourns the loss of a dear friend, but our hearts are filled with gratitude for his life and for the gifts of love and service which he graciously offered to all." In 2010 Foreman received Samford's John M. Buchanan Award for Excellence in Classroom Teaching, Students who nominated Foreman for the award cited his ability to explain complex and abstract ideas, Creed said. Foreman was an active member of Brookwood Baptist Church in Birmingham, where he had been a Bible study teacher and college ministry volunteer. For many years, he served as the judging auditor for Samford's annual student-produced talent show, Step Sing. His illness prevented him from serving this year. He is survived by his wife, Elvia, and two daughters, Julie and Emily. The family has suggested memorial gifts to the David Foreman Memorial Fund, Department of Mathematics and Computer Science, Samford University, 800 Lakeshore Drive, Birmingham, AL 35229.